The Pupil Premium is additional funding to help schools close the attainment gap between children from low-income and other disadvantaged families and their peers. If a child has been eligible for free school meals (FSM) at any point over the past 6 years or has been looked after for one day or more (Child Looked After), the school receives an amount per head within their budget. Provision is also made for children who have a parent in the armed services. The Pupil Premium funding that the DfE provides is not necessarily intended to be specifically allocated to individual learners and schools have the freedom to decide how it can best be spent to ensure that the maximum number of learners are supported. We consider how to allocate pupil premium money on an annual basis following rigorous data analysis and careful consideration of the needs of the children within this group. This Action Plan for Pupil Premium spending focuses on whole-school strategies that impact all pupils: including strategies that target under-performing pupils, and specific strategies targeting pupil premium pupils. We have a clear, strategic approach to the use of Pupil Premium funding, and plans are integrated into wider school support and improvement systems. These are monitored and evaluated regularly and in depth data analysis ensures that the correct support and strategies are identified to maximise progress. Ensuring all staff share responsibility for Pupil Premium actions enables our school to develop a strong support, leading to improved outcomes for all Clover Hill children. In 2018/2019 the DfE allocated £1,320 per eligible primary aged learners eligible for free school meals; £2,300for ‘looked after’ children (i.e. in care, or adopted); and £300 for children from armed services families. Ensure processes for identifying children attracting Pupil Premium funding are in place, and teaching staff updated accordingly. To ensure the efficient deployment of resources (including staffing) to maximise the attainment and progress outcomes of all learners, including those attracting Pupil Premium funding. To ensure progress and attainment is tracked and data analysis indicates the positive impact of the targeted resources DfE obligations on expenditure of PP funding and monitoring of impact are met and reported to stakeholders. Steps taken to improve outcomes made in a timely manner through data analysis. Additional support provided where appropriate leading to improved outcomes for all children, including those attracting PP funding. To ensure children have access to the highest standards of quality teaching Provision enables children, including those eligible for Pupil Premium funding, to meet age-related expectations at the end of their current year group and to make at least expected progress relative to starting points. There is little or no ‘gap’ in the progress and attainment of PP/non-PP children. To monitor the attendance/punctuality of children, including those attracting Pupil Premium funding, ensuring this remains consistent with that of their peers. Government targets for attendance are met. Safeguarding procedures are in place (linked to ‘first response’). To offer nurture support emotional development/wellbeing of vulnerable children. The emotional development and wellbeing of vulnerable children is supported, contributing positively to their educational outcomes. In 2017/18 the DfE allocated £1,320 per eligible primary aged learners eligible for free school meals; £1900 for ‘looked after’ children (i.e. in care, or adopted); and £300 for children from armed services families. The government has set up Pupil Premium funding, which is additional to main school funding, to address the current underlying inequalities between children eligible for free school meals and their peers. This funding ensures that funding to tackle disadvantage reaches the pupils who need it most. The pupil premium funding is provided in order to support these pupils in reaching their potential. The pupil premium is allocated to children from low-income families who have been eligible for free school meals. We think that by spending the pupil premium money in this way we are supporting our most disadvantaged pupils in a broad variety of ways. Not only does it have a positive impact on enhancing their educational experiences and help them to progress within lessons but also develops their self-esteem, confidence and aspirations. We track all pupil premium children extremely carefully through the school in terms of their academic attainment but also monitor their social and emotional needs too. Regular Head Teacher ‘Pupil Progress’ meetings, ‘Additional Needs’ staff meetings enable us to discuss individual children in detail. The impact of the funding has been very positive. 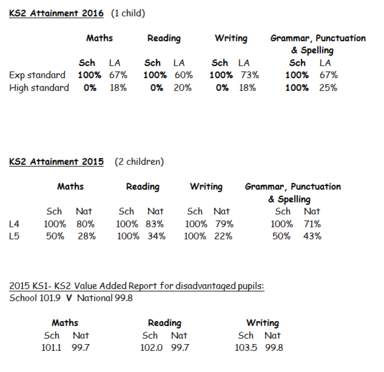 Our recent performance figures for pupil premium children show that they compare favourably with national average children.